I had been craving something with coconut for some time, and it occurred to me that coconut paired with cranberries would be a lovely combination. Cranberries are so wonderful in the wintertime. They add beautiful, seasonal color, as well as a delightful zing to any dish. Of course, my next thought was…let’s make muffins! 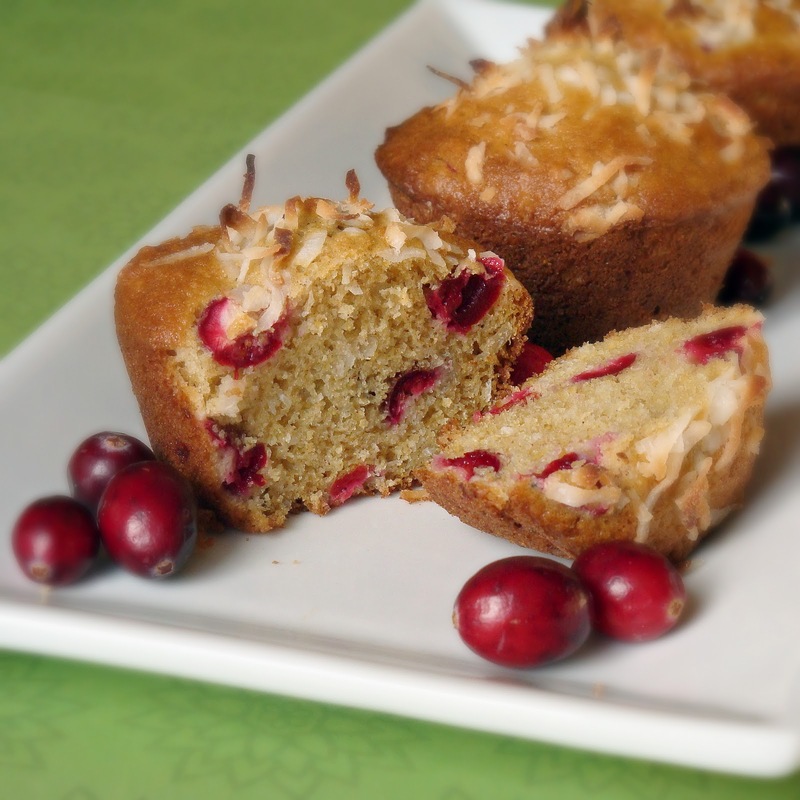 The sweetness of the coconut was the perfect counterbalance to the tangy cranberries. The whole family loved these, especially Adam (though at first, the cranberries were a bit too surprising). Adam asked for coconut cranberry muffins every day for weeks. Quite frankly, an almost 2 year old saying ‘coconut cranberry’ anything is quite possibly the cutest thing ever. As if you didn’t need another reason to make these…they are just plain good! Preheat oven to 400 degrees. Prepare 18 muffin cups with liners or cooking spray. Set aside. In a large bowl, stir flours, sugar, coconut, baking powder, baking soda and salt, until combined. In a medium bowl, whisk together eggs, buttermilk, oil and vanilla. Add buttermilk mixture to flour, gently folding until combined. Fold in cranberries. Divide batter evenly among muffin pan. Sprinkle with remaining coconut. Bake for 15-20 minutes, or until toothpick inserted in the center comes out clean. 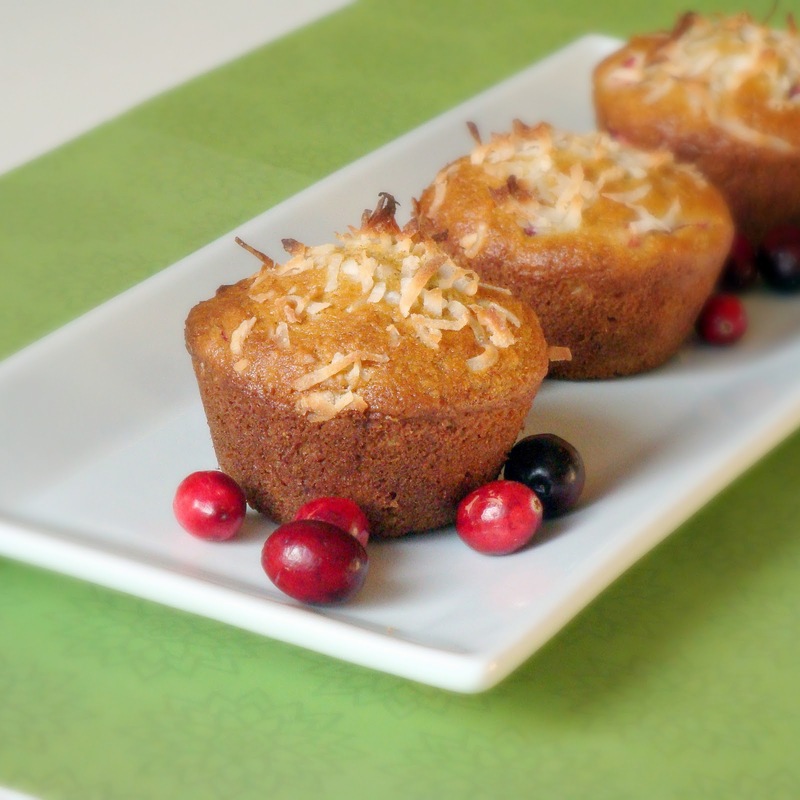 The combination of coconut and cranberries in these muffins is a winner in my book. With the oil and the buttermilk, I know they are moist and have great texture. Well done-yum! Cranberry and coconut – what a wonderful pairing. I’ve never thought of combining coconut and cranberries, but it sounds like a winning mix. These muffins look delicious! I love these flavors Alida! I love the flavour of coconut and cranberry and I also use coconut flour sometime. What a lovely flavor combination for a muffin. Your pictures are so pretty too. I have a sweet treat linky party going on at my blog and I’d love it if you’d come by and link your muffins up. http://sweet-as-sugar-cookies.blogspot.com/2011/12/sweets-for-saturday-50.html. It’ll be open till Monday night.